From the CD cover and the name, you'd expect the latest disc from David Michael Jahn, the one man band know as Glampire (and surprisingly a former member of Robert Fripp's League of Crafty Guitarists), to be the work of a Marilyn Manson wannabe. Thankfully, The Heraldic Universe is an eclectic collection of tunes that throw together glam, guitar-driven rock, dark synths, an occasional techno dance beat and Robert Smith-like vocals into a diverse and captivating sound. 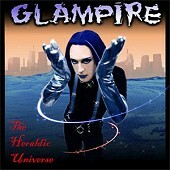 Thanks to a rock-solid release, a strong internet presence and determination, expect to hear the name Glampire alot in the coming years.